As part of my reading and research into sustainable methods for personal food production, I have been collecting information about Aquaponics. Aquaponics is the intersection of Aquaculture (raising fish as food source) and hydroponics (raising produce in soil less medium). Both have been around for a long time, aquaculture at from at least 2500 BC, hydroponics dates back to at least the 1600’s, and both have proven to be effective means of food production. Aquatic animals produce waste (ammonia); in aquaculture utilizing tanks (as opposed to ponds, large cages or nets in open water), some of the water needs to be replaced or filtered in order to keep the water habitable for the fish. 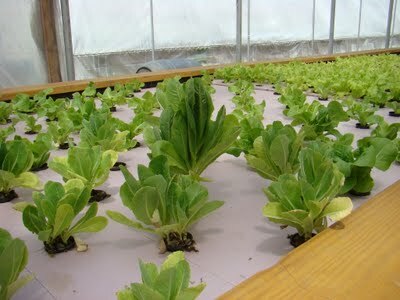 Aquaponics resolves the problems of water replacement in aquaculture and nutrient source in hydroponics. 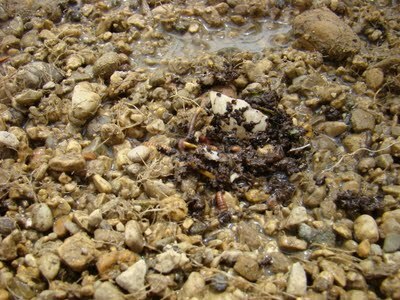 In the simplest terms, the fish poop in their tank, part of the water is pumped at regular intervals into a gravel bed where one bacteria convert the ammonia to nitrites and another converts the nitrites to nitrates, a usable form for the plants growing in the gravel bed. The plants take up the nitrates purifying the water, which then returns to the fish tank. In a perfect system this cycle produces a closed loop, saving water and eliminating the need to purchase fertilizers. Over time, the fish grow large enough to harvest and the produce grows with incredible vigor. I got lucky. In my town there is a small greenhouse operation, that changed hands in the last few years from a commercial for-profit greenhouse into a new non-profit greenhouse and organization called We-Grow Dreams Greenhouse and Garden Center. Their unique mission is “To provide people with disabilities the opportunity to lead fulfilling lives and to train and work in a supportive, safe and caring environment while producing and providing products and service to the community.” I drive past this greenhouse on regular basis, so you can imagine my excitement when I saw Aquaponics”” on their marquee by the side of the road! I contacted them and exchanged emails with Laurie Staple, the Executive Director of We Grow Dreams, and Phil Wolf, a volunteer who is responsible for the Aquaponics program, and we arranged a meeting. It was a beautiful sunny morning as I headed over to the Greenhouse and Garden Center and met up with Laurie and Phil. Laurie, a retired special education teacher, started the tour in the office. There she explained that the purpose is not to train young people with disabilities how to work in a green house, but rather to provide transferable job skills to a population who are often underrepresented in the work force. Currently staffed at 45 team members who work 10 hours a month for minimum wage, We Grow Dreams helps team members gain Social Security credits while performing assigned, coached tasks. 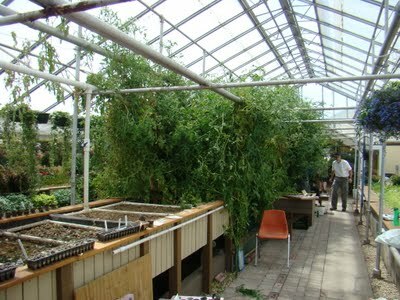 Greenhouse tasks include straightening up around the retail area, assisting customers carrying materials to their vehicles, and moving product from the production area to the retail area. Out in the yard, gravel was being put down to patch some potholes, as Laurie showed me around part of the five acres. Laurie told me the main greenhouse dates back to the 1920’s, and on the grounds there is evidence from previous decades. As we walked through “the dirt room” with an ancient dirt machine used to fill pots, I commented how hot it was. Laurie pointed out that the room was used in the dead of winter, and they ran a kerosene heater to warm it up. Quite a difference six months makes. While we were walking from one house to another, Laurie indicated they receive no state or federal funding, so volunteerism and donations are critical to the success of the organization. After we circled back to the main green house where the Aquaponic set up resides, Laurie handed me off to Phil, an engineer by trade, and We Grow Dreams volunteer spearheading the Aquaponics project. Here he is next to the tomato plants. Granted, the plants start a little higher than waist high but this is crazy! The sheer mass of plants is a little overwhelming. I was a little stunned as Phil sat down and started doing his tests on the chemical analysis of the water. It’s important to keep track of the health of the system so regular monitoring of ammonia, nitrate, nitrite, and oxygen saturation is important. While he performs the tests he gave me the run down – a 1000 gallon fish tank holds about 375 bluegill and some goldfish. This tank supplies the nutrient rich water for the system. Here is a shot from the other side where two volunteers had just finished cleaning out a couple gravel beds. 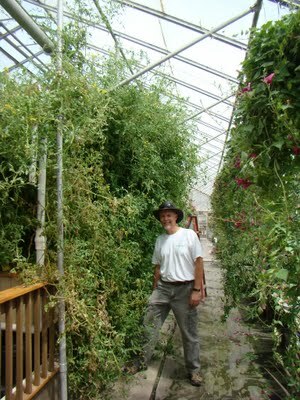 Water is pumped from the fish tank (located under the gravel beds holding the tomato plants to the left of Phil) to the gravel filled grow beds that hold the giant tomato plants. You can see the down pipe that feeds the watering pipes. After running through the gravel beds where helpful bacteria breakdown the ammonia and waste and the plants take up what they can use, the water runs to a 3500 gallon raft tank. Here it is from the other side. The lettuce looks really healthy! If you have any doubts about root development, check this out! The addition of the large raft tank adds stability to the system. Fluctuations in temperature and water quality take much longer when there is almost 4500 gallons of water involved. 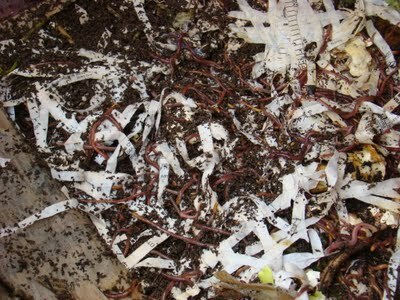 One final bit, Phil is also practicing vermiculture, starting with 1 lb of worms back in January, there are now many times that in the gravel beds and other installations he is involved in. He keeps them busy in a worm bed located under one end of the gravel beds feeding them kitchen scraps. 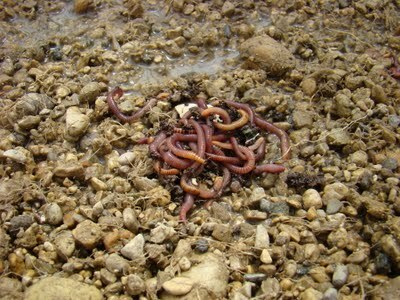 The worms easily crawled down between the spaces in the gravel. 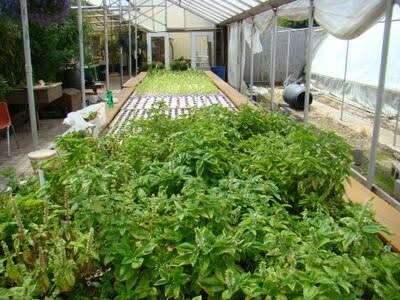 They also consume organic material and contribute their own rich nutrients to the grow beds. To close our conversation Phil indicated he is in the process of writing up a six month review and analysis of the installation. He openly acknowledges this is a learning process and while there has been some trial and error, looking at the results they are on the right path. There is more to do and learn. I was very happy to get an up close look at an operating system. As I said at the beginning of this (long) entry, I am interested in this system for personal use in the future. This was a great first exposure to a live system and I am very grateful to Laurie, Phil, We Grow Dreams Greenhouse and Garden Center for allowing me to come and visit, they were very generous with their time, and their mission is a noble one. I know I’ll be back to check on their progress and to pick Phil’s brain a bit more. If you are interested in additional links and information about Aquaponics, let me know and I’ll share what I have. >How interesting! Thank you for the very informative tour. 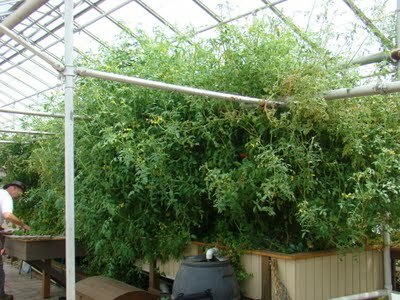 There is a fairly large hydroponics farm near our AZ home. I was pleasantly surprised at how wonderful the produce tastes. The flavor of the tomatoes was like home grown, not at all like "hothouse" tomatoes. Lettuce and herbs, complete with roots, stayed crisp and fresh for long periods. The produce does cost a bit more than what's found in the grocery store, but the flavor and freshness are well worth the additional expense. I priced fish at Costco this week, and ended up buying pork and beef. With seafood prices being so sky high, it would certainly be nice to raise your own. You'd also know what you were eating was safe. >Aquaponics is great. It is easy gardening once set up (Automatic watering, fertilizing, minimal/no weeds, no digging, and depending on how you set it up, no bending.) Then there is also the benefit of getting fish from your garden and being able to sit in your food garden and enjoy the sound of water and watching fish! Phillip is doing some great work there and I look forward to reading his report. >An exceptionally interesting post, David. Thank you for explaining this little-known technique. I expect you will be trying this soon! I won't though – I couldn't bear having all those fish around. >Granny, growing my own and knowing it is safe is my biggest motivator. 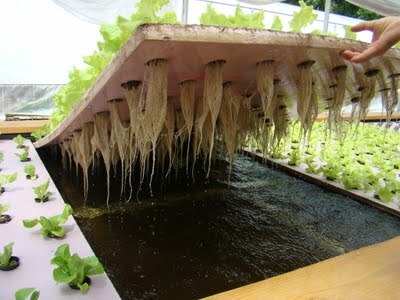 I'd love to see a commercial hydroponic operation! TCLynx – Thanks for coming by! I am still trying ot absorb what I can. A barrelponics system is likely in the works for next year. Thanks Mark, it was an educational process for me as well. I'm just scratching the surface. In terms of doing this soon, perhaps a small system next season to test, and grow familiar with the concepts without a large cash outlay. All those fish? Being an omnivore has its advantages! >wow wow WOW! i'm passing this on to a friend who is interested in aquaponics. incredible! >OFG – it was way cool and really gets the gears turning, share away, and Phil is a great resource. David, Great blog, I will be following. Granny, don't know what part of AZ you are in but I have a small Aquaponics system running in Kingman if you are ever in the area. >AZ – Thanks! It's a small world, part of the fun of blogging is the connections you can make. Thanks OFG!